I really think it’s helpful for students to understand what they’re getting into when they set foot on a college campus. To communicate that, chapter four of the book takes a metaphor and beats it to death. You can likely guess from the picture that we’re talking about “The Wizard of Oz“. While it’s always dangerous to force everybody into some category, I use the four companions on the Yellow Brick Road to identify four key roles within the landscape of the contemporary college. The Scarecrow represents the faculty. The Tin Man represents student life people and coaches. The Cowardly Lion represents administrators. And Dorothy represents the students themselves. It’s possible that you’ve somehow been deprived of the cultural significance of The Wizard of Oz so I’ll fill in the details just a bit. Dorothy Gale is a young girl from black-and-white Kansas who is taken to Oz by a tornado. She lands in Munchkinland on top of the Wicked Witch of the East, drawing the ire of her sister witch from the West. She is instructed to go to the Emerald City to find the Wizard who could surely tell her how to get home. Along her journey she meets each of the characters mentioned above. Together they defeat the Witch, confront the Wizard (a good man but a bad wizard), and get what they thought they were looking for. Dorothy learns from Glinda that she could go home whenever she wished. Back in her bed in Kansas, Dorothy reflects that it was beautiful but scary as well. 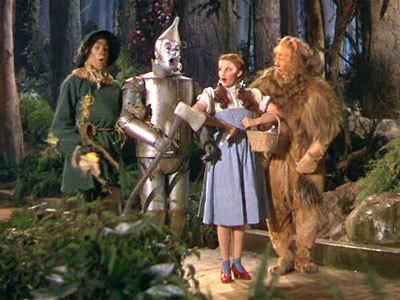 Back to my metaphor: As Dorothy starts out along the YBR, she comes across a Scarecrow. He’s not good as a scarecrow and doesn’t like having his head stuffed with straw. He wants to think great thoughts and share knowledge (it’s all in the song). He “decides” he will go and ask the Wizard for a brain. Clearly a leader along the way, he gets to the end and asks for his brain. The Wizard tell him he doesn’t have a brain to give him, but what he does have is a Diploma. By the authority supposed by him, the Wizard awards the diploma to the Scarecrow who announces the pythagorean theorem in an extremely professorial voice (but he gets it wrong). Faculty members like me are scarecrows. We care about cognition. We worked hard at academic life. We get it. More than that, we’ve invested our personal identity into that life. I really care about what people think about sociology. I don’t understand why they don’t find it as fascinating as I do. If I seem like I think academics trumps other parts of campus life, it’s because for me it does. If you tell me that you blew off my class for frisbee golf, it’s not your grade that’s threatened — it’s my entire way of life. If you ask me “did we do anything important?” I don’t know where to begin. Of course it’s important. I’ve spent my whole life on this stuff. Dorothy and the Scarecrow haven’t gone far when they find the Tin Man. He was the victim of the Witch’s spell and managed to cut off all his limbs. A kind doctor put him back together but forgot to give him a heart. (I don’t know where it went — it’s a fantasy and you just have to go with it). The others describe their journey to the Wizard and they all believe that he should ask for a heart. Student Life folks and Athletic coaches care about heart. It’s not that they don’t care about academics. It’s that character formation is central to their world. They want students to become what they’re capable of becoming. (Obviously, I want the same for my students but it’s a matter of priorities.) Mentoring is at the center of their world. They build personal relationships and, through those, pass along what’s shaped their lives. They tend to be where they are because others invested in them. I can relate a host of stories about students who weren’t sure of direction until that coach took them under wing. Like Obi Wan Kenobi, Tin Men rejoice in a mentoring relationship that succeeds (Luke Skywalker) but fear that it might go bad (Anakin AKA Darth Vader). Each and every relationship has that demanding balance. When the Tin Man gets to the Wizard, he is awarded a testimonial shaped like a heart (it’s the lamest of the gifts). The now three travelers come across a lion in the forest. But they quickly discover that this lion is afraid of everything. He wants to be respected more than feared but nobody takes him seriously. Of course, they tell him where they’re headed and are sure that the Wizard can give the Lion some Courage. Administrators need courage. I’ve spent half my career in administration. Many times the pressures seem never ending. Each option has the potential to be a wrong choice. Decisions must be made without enough time or enough information. And each decision has huge implications for dozens or hundreds of people, their families, and their futures. I was in a strategic planning meeting this week where we were talking about the ten-year vision. We reflected that the students who will begin school in 2023 are starting the third grade right now. It requires courage to take steps into the unknown. Students need to understand that each individual’s case can’t be taken in isolation. There are broad implications for any action or special consideration. It’s not that administrators don’t care about brains or heart. They just have a different set of lenses. When the Wizard comes to the Lion, he recognizes the ways in which the Lion acted even when he didn’t want to and put himself at risk to serve others. So he gives him a Medal of Valor. The label seems to be enough. Dorothy is looking in the wrong place. The whole point of the story is that Dorothy is trying to get home to Aunt Em and Uncle Henry. She thinks that all she had to do was get to the end of the YBR and her goals would be met. The Wizard would magically make everything right because of his great power. Dorothy’s life isn’t about what happens after she leaves Oz and returns to Kansas. It’s about everything that happens to her along the way. She learns about friends, about courage, and mostly about her own capabilities. Glinda says that all she had to do was say, “there’s no place like home” (and click her heels). But more importantly, Dorothy realizes that she knew this deep inside her all the time. It was a matter of trusting who she was and using her experiences to teach her. The purpose of the chapter is to help students make that transition from high school to college. It’s a different world than they’ve seen before with a different group of players who are more different from each other than has been true in the past. Maybe if they learn how to walk the road with knowledge of these various perspectives, they can find in themselves the lessons they’ve always wanted most to learn.